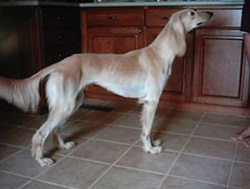 The Saluki is a sighthound that has been carefully bred for thousands of years to have a keenly developed hunting instinct. Populations of desert-bred Salukis used for hunting still exist in the Middle East. Its movement and outline are graceful, suggesting speed, endurance and strength. Its expression is dignified, aristrocratic and regal. Large oval, dark to hazel coloured eyes give the Saluki a far-seeing gentle expression. 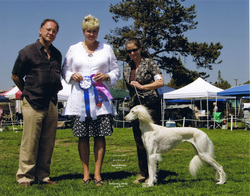 Salukis are intuitive and intelligent. They become very devoted to their humans and prefer the companionship of their family to being left outdoors or in a kennel. Despite their unpampered nomadic history, Salukis may be described as "sybaritic" - appreciating luxury and physical comfort. They enjoy very vigorous outdoor activities as well as lying quietly on a soft bed indoors. 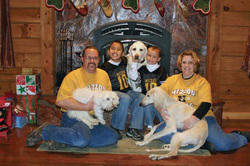 They are naturally clean and integrate easily into family life. 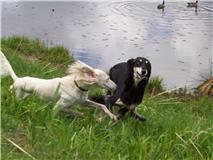 Salukis come in many colours - white,cream, fawn, red grizzle, tricolour or parti-colour. They may be feathered or smooth. The body coat is smooth and soft: the silky feathering appears on the ears, tail, backs of thighs and legs. 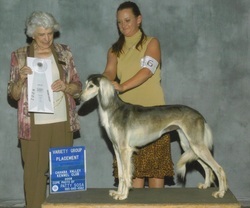 Salukis range from 23 to 28 inches in height. 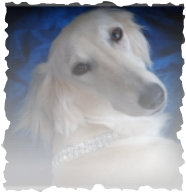 Michael is a service dog plus he is also a model for pet clothing and jewelry.